Good character doesn’t just happen. It is a result of parents who intentionally teach their children about character. Moral character includes values we need to be our best self, like the Six Pillars of Character: trustworthiness, respect, responsibility, fairness, caring & citizenship. Performance character focuses on values that help us do our best work, like diligence, imagination, work ethic, dependability, and a positive attitude. Teach children that their character counts: The Six Pillars of Character provide the vocabulary words to teach your children about character. Enforce the Six Pillars of Character: Reward good behavior (usually praise is enough) and discourage bad behavior by imposing fair and consistent consequences. Advocate Character: Continually encourage children to live up to the Six Pillars of Character. Model Good Behavior: Everything you say and do (or neglect to do) sends a message about your values. Be sure that these messages reinforce your lessons about doing the right thing, even when it is difficult. When you slip, be accountable; apologize sincerely and do better! Our goal is to give parents a variety of ways to teach character. Imagine a parenting toolbox where you can keep all of your parenting strategies. This guide can provide you with more ideas for your toolbox. An Excellence & Ethics Tool. These strategies can help you talk with your children, and can be used with kids or adults, at home, school or at work. 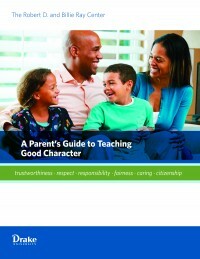 A project of The Robert D. and Billie Ray Center at Drake University, A Parent’s Guide to Teaching Good Character introduces families to the Six Pillars and provides ideas for parents to help teach good character in their home. The Excellence & Ethics Tools are trademarks of the Institute for Excellence & Ethics. These tools have been adapted with permission for use in this guide. Learn more at www.excellenceandethics.org. For more resources, please visit us at www.drake.edu/raycenter, or call us at 515-271-1910.